The success of Jetex motors in powering a wide variety of models encouraged a number of other contemporary manufacturers to try cashing in on the market by producing similar reaction-powered motors of their own design. On this page, we exhibit some of these efforts. Despite the onslaught of these challengers to the Jetex throne, none of them came close to gaining the market share enjoyed by the genuine Jetex motors themselves. Motor Mart announced the existence of a New Zealand Velojet 50 unit last month, and we have now had the pleasure of testing a sample. Price in N.Z. is 13s. for the 50, complete with five pellets, wick, gauze and screw mounting clip, and for export this is reduced to us. A 100 unit is 22s. 6d. in N.Z.  and the same price export. Turned from the solid, it has many new features. The safety pressure release is at the front in the form of a disc against a pre-tensioned coil spring, and the screw cap is very easy to re-fit after loading. Constant use and corrosion make the cap difficult to unscrew without use of ill-advised pliers. Mounting in an "L" shaped bracket is simple. It is a very powerful, well-made job, manufactured by the Betta Model Aeroplane Supply Co., New Plymouth, N.Z. 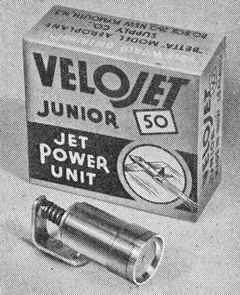 The Type A/50 motor illustrated here used Jetex Red Spot fuel. There was also a Type B/100 motor. Both models were dimensional copies of their Jetex counterparts. The manufacturer was Tiger Manufacturing Inc., 3-1-16 Rokugo, Otaku, Tokyo, Zip 144. "[My example was] distributed in Australia by Aero-Flyte Products Pty Ltd, Panorama, SA and, curiously, carries the name 'Jet-X' on the box. I have seen photos of mint copies of the same motor on ebay but with Japanese labeled packaging. "Mine was originally purchased by a US serviceman stationed in Australia in the late 60s / early 70s. He bought it in a local hobby shop, fired it once, but didn't clean it afterwards. "The entire thing was almost black when I got it. With the help of a jeweller, I gave it the cleaning of its life. The aft closure cap was completely covered in black soot and rust which soon gave way to pitted brass. A mint condition copy of this motor would have this brass area finished with an electroplating of dark brown (as opposed to bright red) copper based material. "The level of workmanship is really extraordinary. Notice that when it is disassembled, the small dark copper disc comes off the end of the aluminum casing. The nozzle is supposed to have this copper plating on it as well. You can clearly see the pitted brass underneath where this copper plating was supposed to be." "Has anybody ever seen the Nova-Jet aeroplane?" "Back in the early 60's, I remember my dad bringing us back two of these planes from a business trip in Europe. We lived in Johannesburg, South Africa. "My brother and I each were given a Nova-Jet in its box. I remember it as being made of white, fairly dense polystyrene foam and was definitely the first molded foam airplane we had ever seen. It was probably 9 inches long with a span only slightly smaller. It came with a hand-held catapult whose elastic sling you hitched to a catch under the nose. The thing flew quite well (but lacked lateral stability) on the catapult alone. "I think that the motors were already mounted on the top middle section of the planes when we removed them from their boxes. 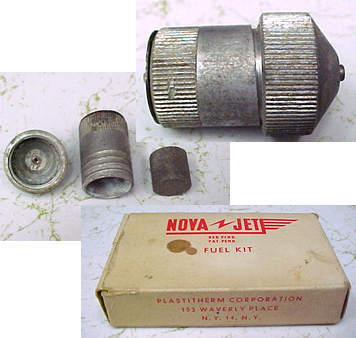 I distinctly remember their shiny aluminium-like feel and appearance: just two parts, the chanmber and threaded nozzle. 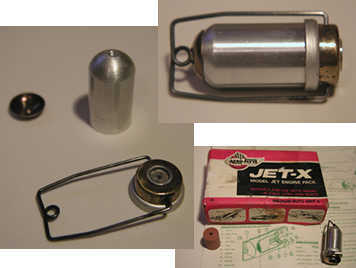 The original package did not include any fuel pellets for these motors, but they worked with Jetex pellets." Does anyone have any information about the company name and patents associated with the company? If you have an answer, even partial, please contact us. "The Nova-Jet apparently was a delta winged elastic catapult launched glider that optionally flew with a Jetex-like engine [pictured]. I have the engine and some fuel pellets, but no airplane, and no pictures of it. "The engine is interesting in that it has a threaded-on nozzle and pressure relief port on the front with a dimpled disk spring that seals the port. It's a fairly hefty aluminum body with an acme threaded aluminum nozzle cap and a steel nozzle liner eyelet riveted in." The original instruction sheet was in badly worn condition (see photograph) but Jim has painstakingly restored the text. An extract is reproduced below; the full text is available on a separate page. Insert the jet fuel pellet (b) all the way into the chamber (a). Push the fuse (e) through the jet nozzle (d) and bend it a little, do not break it, at the interior end as shown in the above diagram. Screw the cap (c) onto the chamber tightly to avoid gas leakage and push the extending fuse into the chamber so that approximately only 1/4 inch of the fuse protrudes from the jet nozzle. By this method, the fuse is assured perfect contact with the jet fuel, and false ignitions can be avoided. Light the fuse and launch the plane as described above.